Erin is involved in all aspects of claims submission and review, including settlement agreement interpretation, design and implementation of procedures for evaluating claims, development of notices and forms, training claims reviewers and addressing questions from claimants and attorneys. She began her career at BrownGreer working on the Black Farmers Discrimination Litigation Settlement program and later worked on the Seafood Compensation Program in the Deepwater Horizon Economic and Property Damages Settlement. Erin currently works on the NFL Concussion Settlement Program. 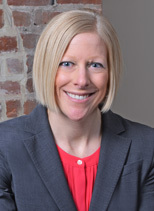 Erin joined BrownGreer in 2012 after several years in e-discovery, civil litigation and workers’ compensation. While in law school, Erin served as a teaching assistant for Legal Research and Writing courses and worked as a student attorney in her school’s Juvenile Law Clinic.